Enlarge / The mechs crumple, explode, list, and flare with a surprising amount of detail. BattleTech is out to get me. The turn-based tactics game from Harebrained Schemes—the studio that cut its teeth on resurrecting “Nineties Cool” franchises with Shadowrun Returns—has now revived the world of MechWarrior in absolutely savage fashion. The studio’s latest chosen universe blends grounded combat between ostensibly humanoid robots with medieval politics transplanted to the final frontier. It is, to put it mildly, entirely my jam. Which is exactly why I’ve let BattleTech endlessly brutalize me for the past few weeks. BattleTech is very difficult, although not in the ways you might expect. The game sets you up as a mercenary in the middle days of the same universe as MechWarrior, but instead of piloting multi-ton titans, the player now assumes the role of a mercenary leader. It’s through the uneven responsibilities of a small, violent business owner that BattleTech challenged me the most. As any businessperson knows, you need to spend money to make money. Pilot contracts, guns, repairs, missiles, and interstellar taxis called JumpShips all require cold, hard currency. To make matters worse, some off-screen investments have also left your company paying down interest on several loans every month. Failing to make those payments is BattleTech’s true failure state; everyone and everything that gets blown up in between is just the cost of doing business. At least business is plentiful. After too few tutorial missions that explain too little, you’re thrust into deep space without a compass but plenty of available contracts. These randomly generated missions range from defending easily ambushed convoys to assassinating much more powerful foes and their growing reinforcements. The main limitation is that you only ever get to launch up to four comrades into battle. The odds continue to stack against you, but BattleTech forces you to rely on better tactics and increasingly specialized mech loadouts to overcome them. Each class of mech comes with a default loadout. One style of Hunchback, for instance, forgoes the machine’s signature autocannon in favor of endless medium lasers. But that predefined variation is just a starting point to get you tweaking things in the Mech Bay. There, you can fastidiously adjust armor values, decide between jumpjets or more heat sinks, and see if you can turn a middleweight sniper into a close-range jackhammer. Being able to fly over movement-restricting forests is nice. So is being able to shoot more than once before overheating. Mid-battle, the decisions boil down to positioning and weapon micromanagement. This isn’t XCOM, and your “soldiers” are 60-ton walking tanks, not people. That means abusing every advantage—from high ground to rare patches of cover to each mech’s limited directional field of view—is vital to keeping them operational while stomping around out in the open. You can’t just fire all your weapons as much as you want with abandon, though. Too much maximum firepower can lead to overheating and taking structural damage. Like other mech games, BattleTech lets you toggle these salvos into less taxing (and less effective) strikes. Choosing your character’s backstory determines their stats—as well as future dialogue options. Your eclectic mercenary crew doesn’t get a lot of backstory, but what’s there is well composed. Tinkering with mechs is a fastidious and potentially rewarding (or disastrous) process. Why shoot a tank when you can step on it? Rare cutscenes are presented in lightly animated, well-painted 2D art. Hop around the galaxy to pick up procedurally generated missions and feed your crew for another day! Random events add more scripted flavor to the emergent missions. Working with your environment is crucial. Standing in water keeps mechs cool but slows them down, too. Knockdown strikes are a good way to kill pilots without damaging their valuable vehicles. Different classes of mechs come with different strengths, like long-range weapons, and weaknesses, like less armor. This is the kind of management that makes me start to sweat. Sure, overusing my Catapult’s twin particle cannons will cause its insides to melt. But not using them this turn might leave that enemy Firestarter just alive enough to get into range. I’ve swatted these paper-thin suckers before, but their quick flamethrowers could throw my squadmates into overheating anyway—possibly even to the point that their mechs shut down entirely. That kind of total breakdown, in turn, would leave me with more than just a hefty repair bill. The mech could lose a mechanical arm along with all of its attached weapons to a precision hit. Or one of my painstakingly leveled pilots could actually die permanently, which would save me money in the short-term. Dead mechs don’t make overtime, after all. The failure cascade of losing another mech, when I’m already outnumbered and outgunned, is rarely worth it. So I decide to squash that firebug using another method: ramming my chicken-legged artillery into the damn thing head-first. Leveling up specific pilot stats in BattleTech hardly feels worth it at first, but a few extra percentage points of accuracy or a few less in penalty for firing missiles over obstacles adds up. In this situation, Behemoth’s high Piloting skill makes her a martial arts master in slow motion, making her melee attacks more than a match for the Firestarter’s itty-bitty frame. It doesn’t hurt that small weapons, like the Catapult’s dual machine guns, fire automatically along with physical attacks. In this case, Behemoth doesn’t just slay her fragile foe. Because she didn’t fire any big-kid guns, her heat buildup actually drops. At the same time, her movement produced evasion charges that will make her harder to hit. That whole drawn-out cause-and-effect decision tree is just an example of a single turn in BattleTech and not even a very complicated one. I could have withdrawn my forces whole cloth, sacrificing some pay but also earning some money for even partially completed side objectives. I also could have ejected my most vulnerable pilot before the Firestarter could leave them vulnerable, losing the Mech for one mission but keeping the valuable shell—as well as the meatbag inside—safe for salvaging. BattleTech’s true triumph is that none of these decisions is necessarily the one right choice for the situation. You’re going to get hit. You’re going to lose pilots, limbs, and rare versions of long-range missile launchers. BattleTech’s slim tutorials don’t do enough to make you comfortable with that inevitable loss, and they don’t teach you how to navigate the UI and mitigate your losses. The scripted story teaches you these lessons quickly, though. One early stage promised me extra payout if I could just kill every enemy without blowing up expensive ammo depots. Spoiled on typical game design, I flung myself at this sniper-infested mission for an entire afternoon, save-scumming time and again to achieve that perfect run. But it wasn’t possible. Besides the enemy mechs and tantalizingly explosive ammunition, there were also escaping convoys, and chasing them meant splitting up my forces. Caught between turrets, fleeing flatbeds, snipers, and overworked heat sinks, I finally saw that my way through was to give up on the big score. Instead, I focused on the heavy Dragon mech that had been bombarding me throughout the mission, blowing the smug lizard’s legs off with a single flash of laser to the ammo crate it had so carelessly posted up next to. I lost the extra payout but kept my crew alive and made just enough to feed them for another month. The end result wasn’t satisfying, exactly, but it was at least satisfactory. I made it out with a story and the ability to tell it; the other guy did not. My MechTech, a heavyset cyborg named Yang, probably still wouldn’t enjoy buffing out the beatings I gave our Shadowhawk and Blackjack. Although I could smooth over the conversation by showing him that Dragon—which I managed to salvage and add to my ranks after our bout. Maybe he’d even be in a good-enough mood to talk about his days fighting for the Capellan Confederation. These interactions with the competent oddballs who run your ship are slight but well-written. They add appreciable, scripted depth to the emergent storytelling of BattleTech’s skin-of-your-teeth adventures. Either narrative would work without the other, but together they add even greater color to BattleTech’s fairly standard tale of reclaiming space from an authoritarian regime. 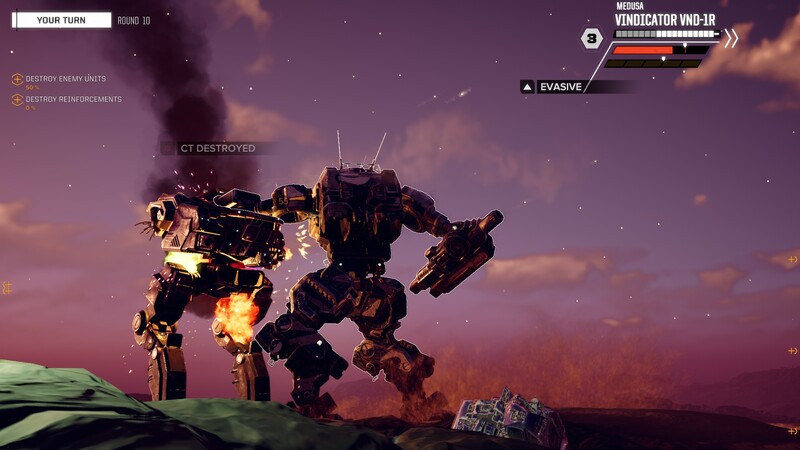 It takes a lot of patience to reach the point where you can see the rhythm of BattleTech’s story missions, roll with the inevitable punches, and twist them into counterattacks. The game’s systems are almost too much to swallow at times, and you don’t get the usual steady flow of upgrades to flatten the difficulty. Once things get moving, though, the workmanlike acceptance of your debt-ridden situation is its own kind of reward. That level of harshness and rough edges won’t be for everyone, but it’s exactly the kind of challenge I can’t turn away from. Verdict: BattleTech throws players into the deep end, but what a depth it is. Buy it if you want a turn-based tactics game that forces you to take a hit or three.